For other uses, see Druzhba. 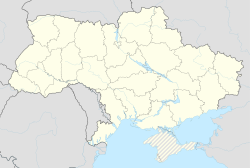 Druzhba (Ukrainian: Дружба) is an urban-type settlement in the Terebovlia Raion (district) of Ternopil Oblast (province) in western Ukraine. Its population is 1,647 as of the 2001 Ukrainian Census. The town was founded in 1896 as the village of Zelena (Ukrainian: Зелена). In 1963, the village was renamed to its current name, and it was upgraded to that of an urban-type settlement in 1986. ^ "Druzhba (Ternopil Oblast, Terebovlia Raion)". weather.in.ua (in Ukrainian). Retrieved 24 January 2012. ^ a b "Druzhba, Ternopil Oblast, Terebovlia Raion". Regions of Ukraine and their Structure (in Ukrainian). Verkhovna Rada of Ukraine. Archived from the original on 4 March 2016. Retrieved 24 January 2012. This page was last edited on 22 August 2018, at 20:09 (UTC).